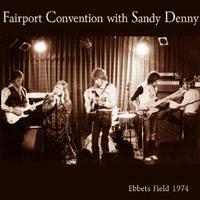 Fairport Convention with Sandy Denny are captured in what might not be their exact finest hour. If not, then this must be as close to that point as they ever got. This live recording was remastered by both Jerry Donahue and Dean Sciarra for aboutmusic.com, and originally engineered by Norm Simmer in 1974. This is something done very well, with such an effort one can easily agree that it might go down in history as one of the best existing Fairport releases. All are caught in their elements here, including the crowd participation. I find this to be an organic rendering. The work that went into remastering this resulted in the ability to hear the furthest pin in the house drop. If you like folk music, especially FC and Denny, this is for you. If you don't enjoy folk music, this would be a good way to get acquainted with it, as you will be hard pressed to find a better authentic folk band and this is one that was best heard live. My hat goes off to Donahue and Sciarra for their fine efforts in making this recording all it can be and releasing it. I also have to mention that after enjoying this CD I am now officially a fan of violinist/vocalist Dave Swarbrick, because this edition brought out Swarbrick's sound better than ever before. This begins with an introduction, then Denny takes the microphone and the rest is pretty much history. There is no mistaking her voice for anyone else's, and her delivery is as good as it gets in bands with female leaders. She shines brightly on the opener of this fantastic concert. The band really get into showing what they're all about right way on this live version. They make no secret of how differently they approach their songs live. The Irish jig is taken quite a step further on this great tune. The acoustic guitar and violin begin to complement instantly on this number, and if you like that, be prepared for a lot more. This is killer. Donahue also adds some fine electric lead guitar work as well. On this track Denny is not featured on lead vocals, but she does add a lovely background vocal. This is where things go into full octane with awesome acoustic guitar and violin dueting in the mid-section. They create a barrage of notes that sweep each other up and toss them at the crowd with precision effect - brilliant! Things continue down the same road here, with yet even more unison guitar and violin soloing away. This is as close to authentic medieval music as I've ever heard from any relatively modern band or artist. Talk about the real deal, this is what folk is really all about in my opinion. First rate musicianship is displayed here so well that by the end of it, the song itself doesn't really matter, and it works best as a show piece. This starts with a moody feel and stays the course throughout. An emotionally charged performance from Denny is featured and it's full of sounds of a familiar nature concerning. There is an obvious ring of Joan Baez here, mainly because the Denny and Baez are just from the same league. Denny puts on a chilling performance here. Lovely acoustic sweep picking really accentuates the best in Denny’s voice. This is more of a complete band focused number. Excellent vocals by all are showcased here but Donahue seems to have more control of the arrangement than anyone else. There is little music to this, but it's so effective that the absence goes practically unnoticed. I consider this to be a gem of colossal magnitude as it clocks in as the longest number in the set. A light acoustic guitar sets this up and the cymbals add a lovely effect. Once Denny sings it’s just plain over. She has what I consider to be one of the best female voices in history. This is both evidence of that and another of the most enjoyable moments in the show. This is another fine tune that contains all of the better elements of this massively under-appreciated band. A nice pop feel begins this but the heavy cello-like sounds almost cut that off. Denny brings it back with her all familiarized lyrical and vocal style. This is a wild and wonderful tune with Denny dominating all the way. It also rings of Baez again, but Denny is original here nonetheless, so it's just one of those things where a comparison is always going to be there. There is more excellent use of violins and also some very cool guitar picking as well. They almost go into sort of a “Bonanza” feel toward the end with a very western vibe. This is awesome! This is the one time they leave vocals out of things and just jam away together. This is a testament of their instrumental abilities. Things come to an end with one of their more mainstream sounding tunes, but at the same time it contains complexities way beyond the norm as well. This has a country tone that works very well after all of the extreme folk stylings that are showcased in their great performance. It's a proper ending to a stellar concert playback experience.